Komodo National Park, famous for dragons, so-called adrenalin diving and abundant marine life, is located more or less in the heart of the Indonesia archipelago. The UNESCO World Heritage site consists of Komodo Island itself, Rinca Island, Padar Island and numerous smaller islands around them. If you’re thinking about a dive trip, read on for everything you need to know. 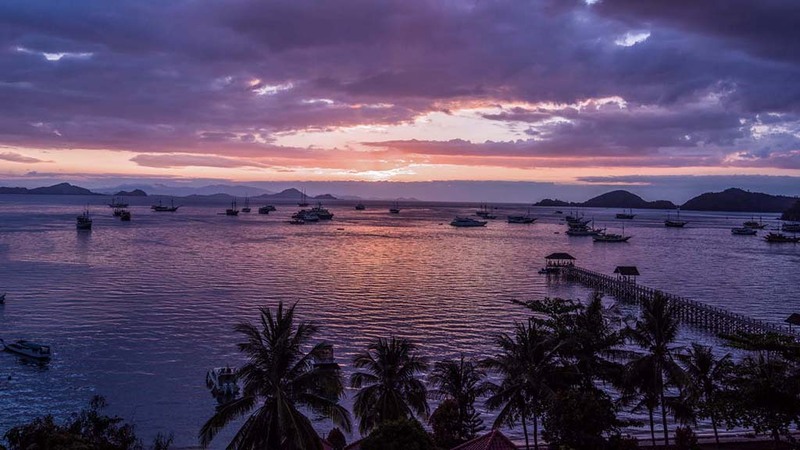 Travelling to Komodo is easy with numerous daily flights Komodo Airport in Labuan Bajo from neighbouring international Indonesian hubs including Jakarta and Denpasar (Bali). Labuan Bajo (LBJ or ‘Bajo) is a fishing town located at the western end of Flores in the Nusa Tenggara region of east Indonesia. It is the gateway to the national park and is home to a whole range of accommodation choices for those after a land-based adventure. A multitude of liveaboard boats also depart from Labuan Bajo Harbour which is an easy 15-minute taxi ride from the airport. It’s possible to dive Komodo year-round, however the liveaboard ‘season’ is between May and September, the dry season for Nusa Tenggara region. Liveaboards can be affected by adverse weather in the wet season (rough seas) but it is still possible to dive throughout the wet season, with ocean currents ensuring good visibility. Resort-based diving is primarily in the northern half of the park due to proximity. The difference between northern, central and southern sites is defined by temperature. In the north the water is typically warm and very clear with visibility averaging 25m (but it be as much as 40m) and average water temperature: 27-28°C (recommend 3mm long suit). The stronger currents make these sites mainly suitable for experienced divers, although exceptions can be made at quarter moon phase. The strong currents make for interesting dive plans and some pretty fast drift dives, so in this area good buoyancy is a must. 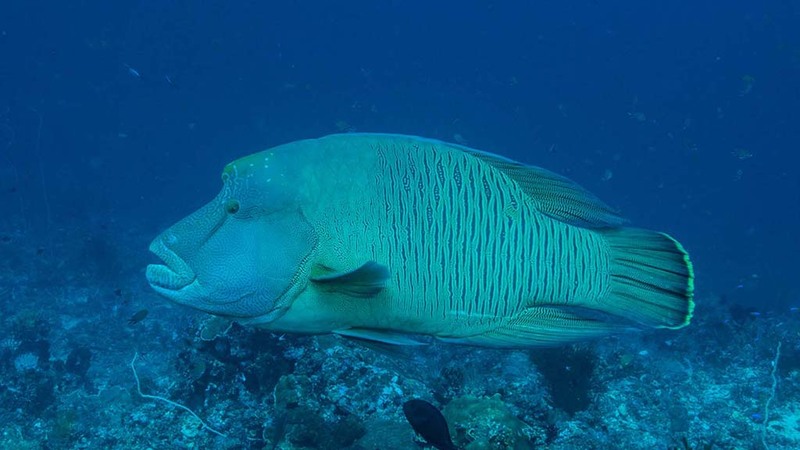 The volcanic topography makes for impressive underwater landscapes and the strong currents attract the big stuff including white and black tip sharks, grey reef sharks, Napoleon wrasse, mantas, mobula rays and large schools of giant trevally. 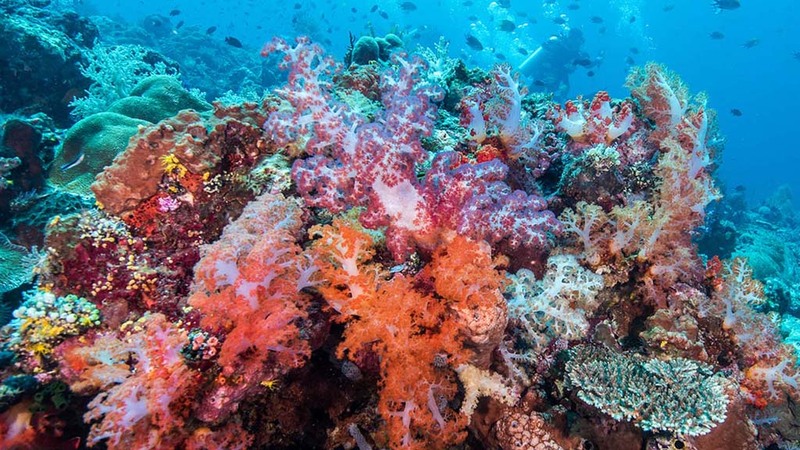 Not to mention the colourful coral reefs and reef fish. In the rainy season between December and March these sites might at times not be accessible due to north-western winds. 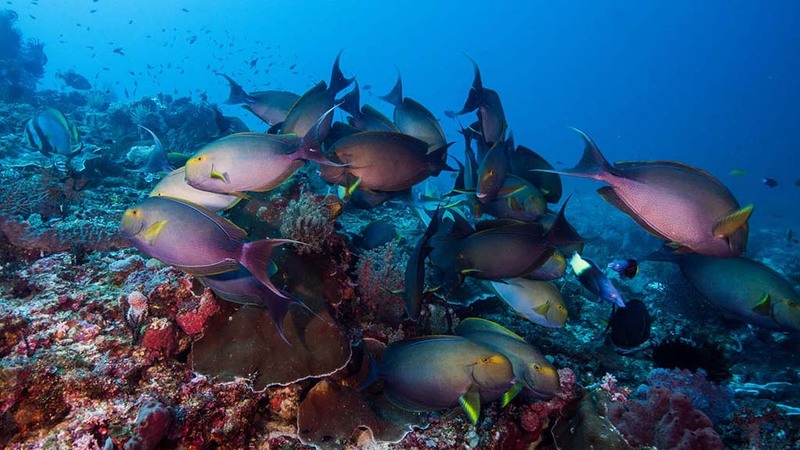 Komodo’s central area has the most varied diving. Marine life can be completely different between sites within close proximity. Average water temperature is 27-28°C (recommend 3mm long suit) with visibility anywhere between seven to 30 metres (average 15m). 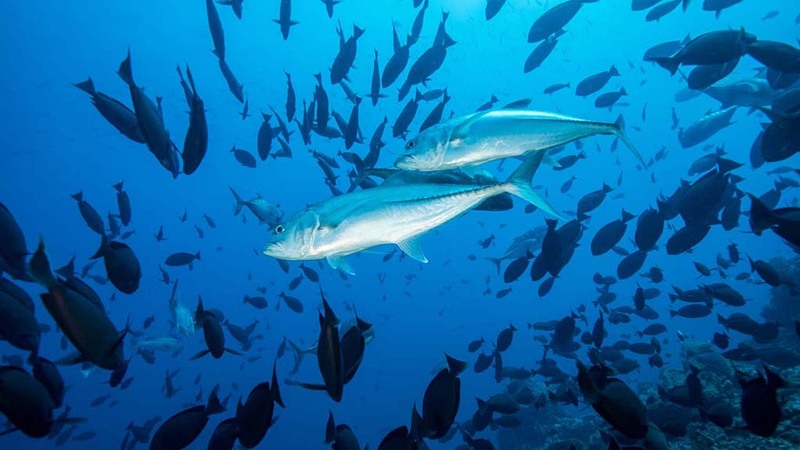 It’s possible to dive year-round, with some dive sites better between April and November. There are wall dives, pinnacle dives, drift dives, sheltered coral gardens as well as great muck diving. You’re pretty-much guaranteed turtles and reef sharks, and mantas are frequently seen at two of the sites. It is hard to summarise the Central as a whole as each dive site has its own treasure from muck to mantas and healthy corals everywhere. The water is a bit cooler in the southern areas, averaging 23 to 24°C (recommend 5mm full length suit). Visibility varies with upwellings between seven and 20 metres (average 12m). The best season for diving in the south is from October to April, as you frequently get clearer warmer water flooding the sites. 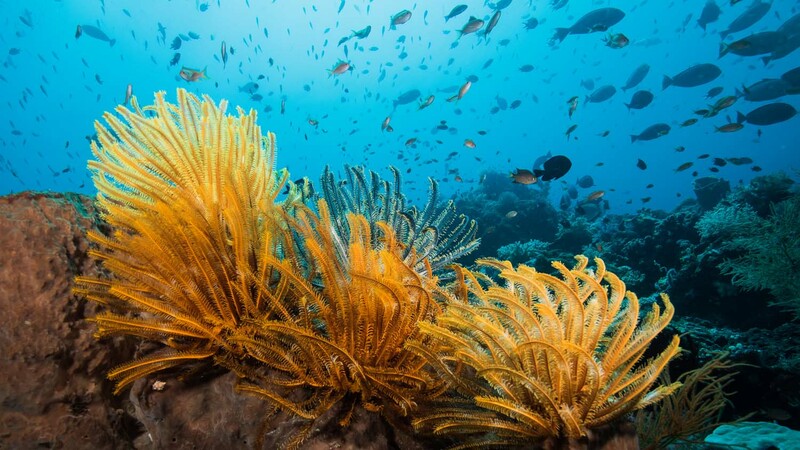 The reefs in the south are vibrant in soft coral life, large branching corals, and sea fans. The invertebrate life here is a macro-lover’s dream come true. There is just so much, nudibranchs, frog fish, pygmy sea horses and torpedo rays. 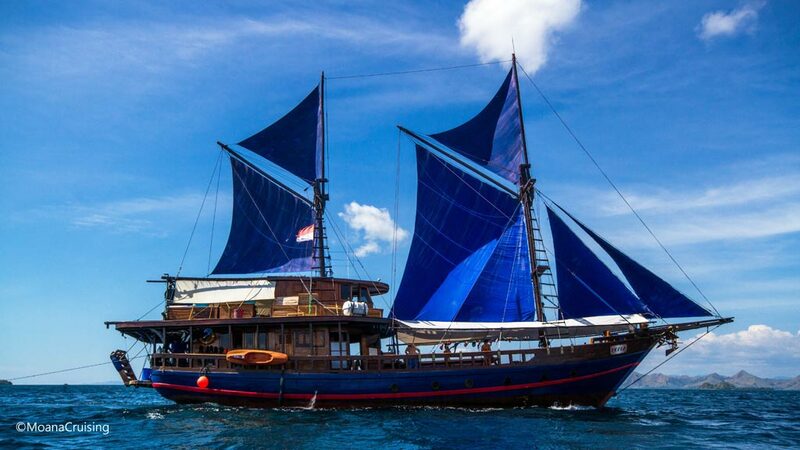 If you want to experience the full range of Komodo diving, a liveaboard is the best way to do this, and there is almost an endless choice, from budget to luxury and everything in between. Most boats include land-based day trips on their off-gas day to Rinca Island to see the Komodo dragons and depending on the itinerary, a surface interval visit to one of the famous pink beaches in the area. There are plenty of tour operators in Labuan Bajo who run hiking, Komodo dragon tours, pink beach days and snorkelling trips, so if you’re travelling with kids or non-diving family members, you can put together a great mix of snorkelling, diving and other activities to keep everyone engaged over a week or so. There are dragons on Komodo Island, but Rinca Island has a better setup, tends to be less busy and has more hiking trails. There are park fees associated with all trips into the National park and these go towards facility upkeep and ranger wages. Padar Island has a great hike with views along the way and especially at the summit (take plenty of water and sunscreen as there is not much shade on the island trails). It’s best to go early in the day as the early morning/sunrise views would be an Instagram favourite for sure. Padar Island is also where you’ll find a famous natural phenomenon: a pink beach. This peculiar beach gets its colour from red coral fragments. It is definitely a great place to spend some time by just laying back or enjoying the underwater world with your snorkelling equipment. Flores has very distinct in cultural practices worth taking time to explore and experience. There are cultural village tours, both half and full day that include performances such as the traditional bamboo pole jumping game ‘Tetek Alu’, the ‘Ndundu Dake’ dance and ‘Caci’ performances. The night life and range of restaurants is always growing with something for everyone’s taste to be found. The choice of food ranges from spicy aromatic local dishes such as nasi campur through to milder western fare, with cheap eats normally a stone’s throw of most hotels. A standout is the Treetop Restaurant which has a menu with something for everyone, attentive staff and a great location. For jaw-dropping views and cocktails, La Cecile is a great place to end the day (or in fact, your dive trip). Garuda Indonesia has generous sporting goods baggage allowance (An extra 23kg on International flights), just be sure to mention you have scuba equipment on check-in. If you are flying in on a domestic flight only, check with your travel agent (that’s us) or airline for excess baggage fees. These are normally quite reasonable but often cheaper if your pre-purchase.